Copper coinage for the state of New Jersey was authorized on June 1, 1786, and large numbers of coppers were struck dated 1786, 1787 and 1788. The great majority of these coins depict a horsehead and a plow on the obverse and a shield on the reverse. Many hand-cut dies were prepared and used, resulting in over 100 die marriages that are easily distinguished and are now noted by their Maris numbers, as first enumerated by Edward Maris in his 1880 monograph entitled A Historical Sketch of the Coins of New Jersey. 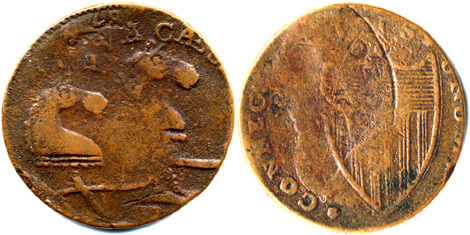 The double-struck New Jersey copper pictured here is an example of the so-called “Camel Head” variety (Maris 56-n), a variety characterized by a particularly prominent nose on the horse’s head. This variety frequently comes overstruck on other coppers that were in circulation at the time, for example Connecticut coppers, British halfpennys, Irish halfpennys, and even a George Clinton copper (for examples of these, see Stack’s sale of the John J. Ford, Jr. Collection, October 14, 2003, lots 182 through 187). Examination of the obverse of this coin shows that it was struck twice by the New Jersey dies, first off-center by about 20% to 2 o’clock, and second off-center by about 30% to 8 o’clock, resulting in the 2 prominent off-center horseheads. 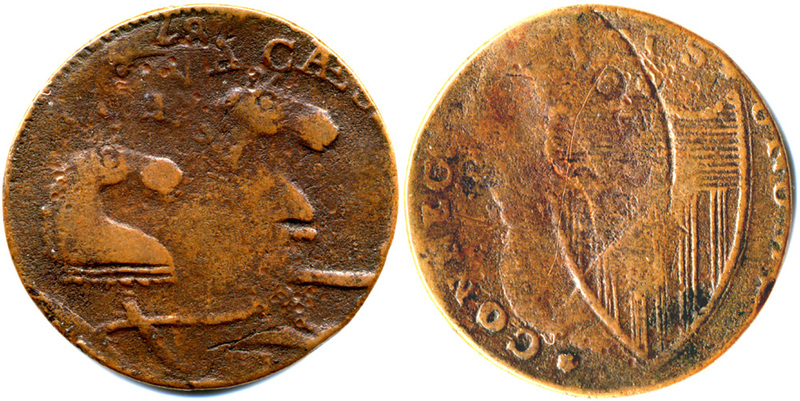 In addition this coin was a Connecticut copper before it was struck by New Jersey dies, with the “87” of the 1787-dated Connecticut copper appearing at the top of the obverse. Looking at the reverse, the Connecticut undertype is even more clear with the letters “CONNEC” visible at the edge of the coin from about 6 o’clock to 10 o’clock. We also see a shield from a New Jersey reverse, and this shield lies directly behind the first horsehead on the obverse, indicating that during the first New Jersey strike this coin was hit by both obverse and reverse dies. However, there is no second shield on the reverse. Instead there is a curved indented line that begins at the very top of the coin and ends towards the right of the center of the coin, and just inside this curved line can be seen the reversed and incused letters “GEO”. These features are from a British halfpenny that was lying between the reverse die and our coin during the second strike, so that an incuse impression (a brockage) of the British halfpenny was imparted to the reverse of this coin instead of an impression from the New Jersey reverse die. The “GEO” letters are from “GEORGIVS” on the obverse of the British halfpenny (see the 2004 Redbook, page 48), and the curved line is from the edge of the halfpenny. It seems likely that in the striking of this coin the reverse die was the upper (hammer) die, and the obverse was the anvil (lower, stationary) die. If so, the striking of this coin might have happened as follows. First, this coin, an already-struck Connecticut cent, was fed into the coining chamber but didn’t go all of the way in and received an off-center strike from both obverse and reverse dies. Then this coin was only partially ejected from the coining chamber and a British halfpenny, the next coin intended to be made into a New Jersey cent, was fed into the chamber and landed partially on top of this coin. Because the British halfpenny was lodged between this coin and the reverse (upper) die, it prevented this coin from being hit by the reverse die during the next strike, and caused the brockage to occur as the design from the English halfpenny was impressed into this coin. So an analysis of this coin allows us to reconstruct a brief period of time during which a Connecticut cent was followed by an English halfpenny into the coining chamber for New Jersey coppers. And furthermore this colonial copper may be unique in that it bears markings from three distinct coinages: New Jersey copper, Connecticut copper, and British halfpenny. Comments may be directed to hhilgard@aol.com.